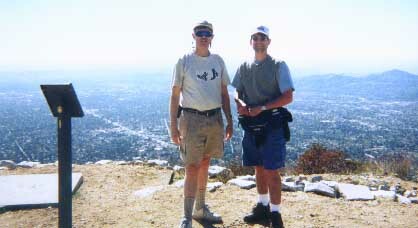 Dan and Drew atop of famed Echo Mountain with Pasadena in the background (south). 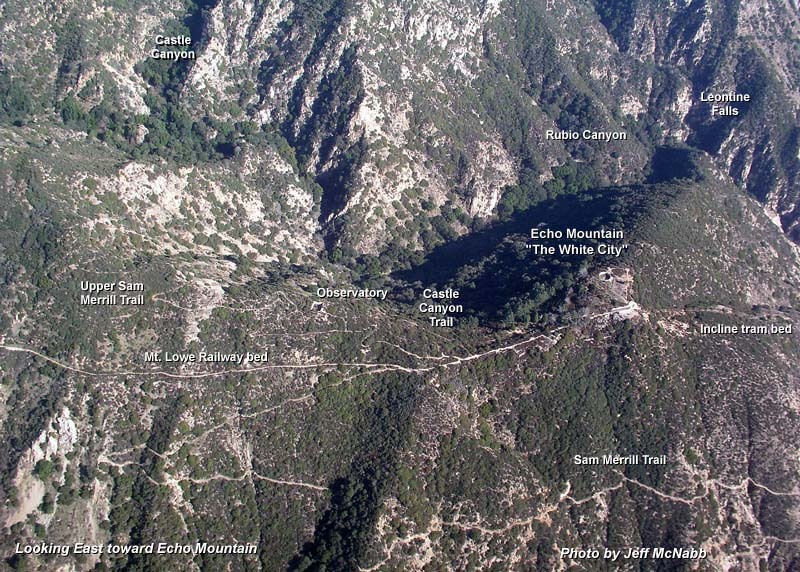 The well popular Sam Merrill Trail climbs 1,400 feet in 2.5 miles from the trailhead at the end of Lake Avenue in Altadena. Looking north back up the Mt. 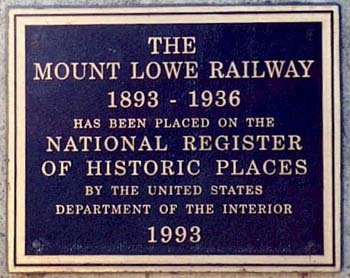 Lowe Railway rail bed. Up the path on the right you can see the large bull-wheel which was part of the incline tram machinery. 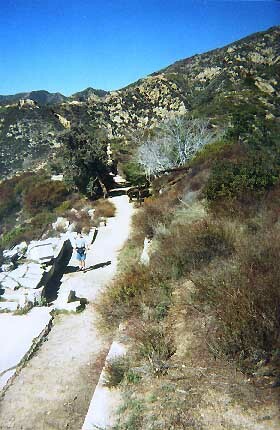 The tram carried guests from Rubio Canyon to Echo Mountain. On the left is the remains of the railway powerhouse. The mountain ridge behind leads up to Mt. Lowe (5603'). 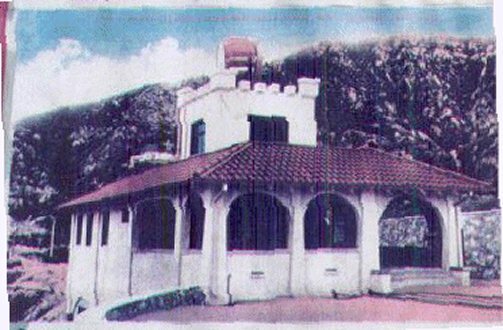 Echo Mountain was the site of Professor Lowe's "The White City" including a hotel, chalet, dormitory, observatory, powerhouse, machine shop, reservoir, and a small zoo. Through a series of fires and windstorms, the attraction was gradually destroyed and finally closed 1938. 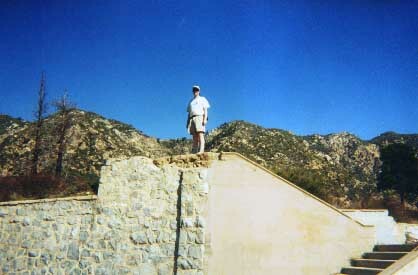 Dan on top of the steps of the elegant Echo Mountain House. 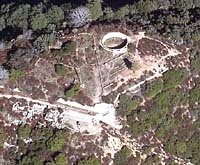 Today these foundations are clearly seen from Pasadena, looking like white rock on the mountain side. 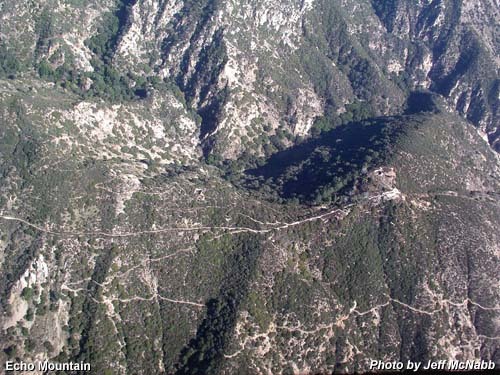 Looking East Toward Echo Mountain from helicopter pilot Jeff McNabb - 12-13-03. 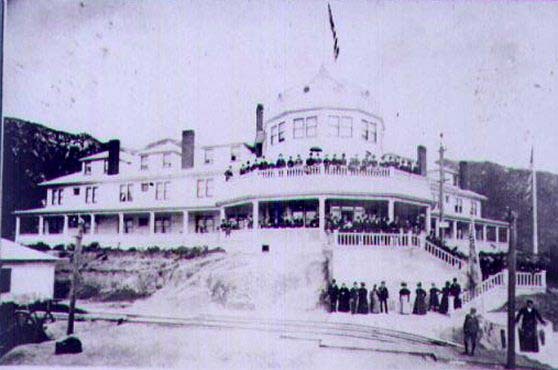 The incline tram bed ascends from the bottom right corner. The rail bed runs off to the left of the photo with powerhouse ruins below it. 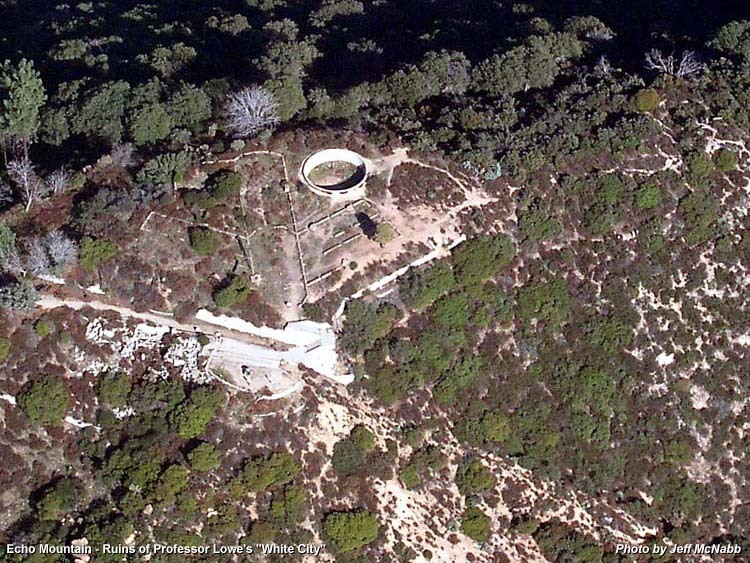 In the middle, the footings of Echo Mountain House outline the footprint of famous hotel. 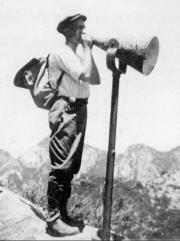 To the right of the distinctive round form is an "echo phone" (not visible in the photo) which still gives visitors a chance to test the acoustics for which the mountain is named. This page was last updated April 9, 2006.